When I opened the mailing box to find three pairs of EarSkinz, I wasn’t super impressed. Especially as this model, the ES2, so closely matched the shape of the EarPods it’s designed for use with, I figured it was just another throwaway product. My apologies for even writing the above, but imagine my surprise when EarSkinz turned out to be an essential accessory for my set of EarPods. I’m even thinking about buying a pair of ES1s for my older Apple earbuds. 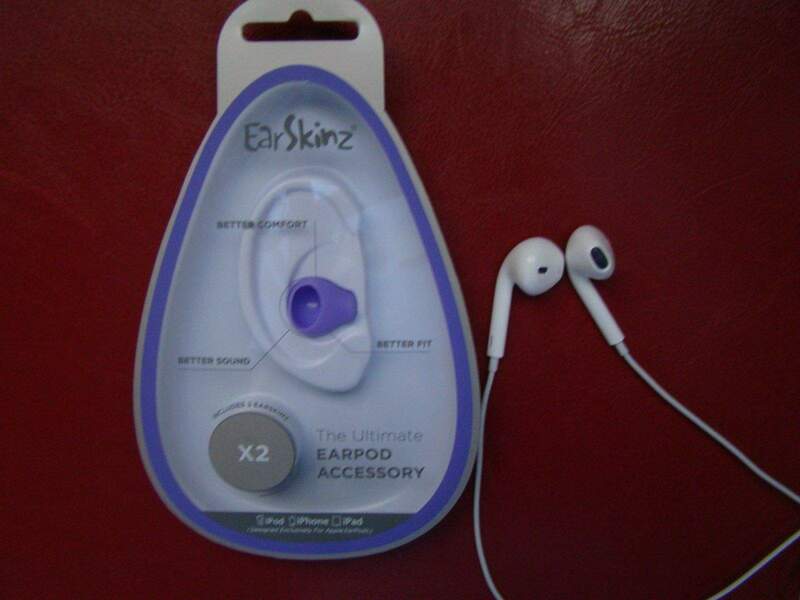 The EarSkinz marketing material claims that the little ES2 silicone earbud coverings will improve the comfort, fit, and sound of a pair of EarPods. I found that they indeed improved the comfort and fit, but I’m not so sure about improving the sound, though of course your mileage may vary. 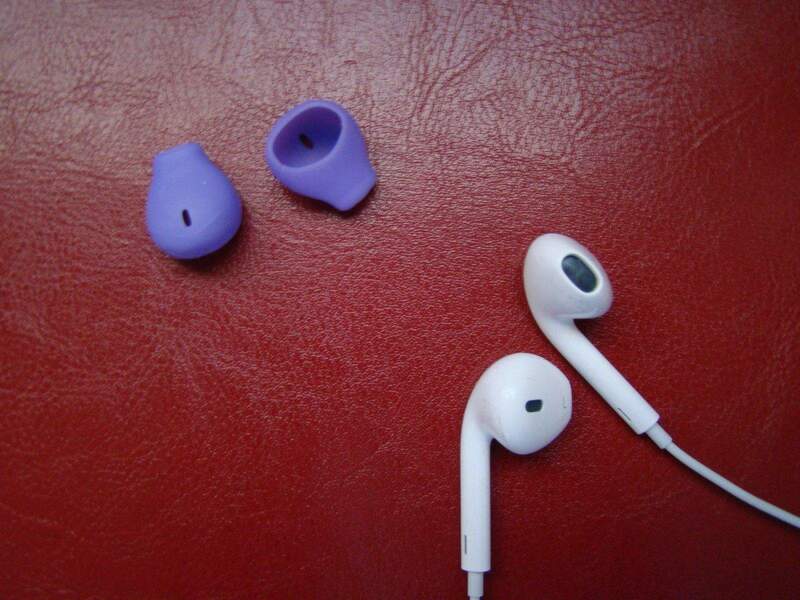 I opened the attractive packaging for a pair of purple EarSkinz, and started to put them on my white set of Apple EarPods. The silicone is thick enough to not feel flimsy or tearable, but thin enough to stretch around the EarPods, providing a tight, glove-like fit. 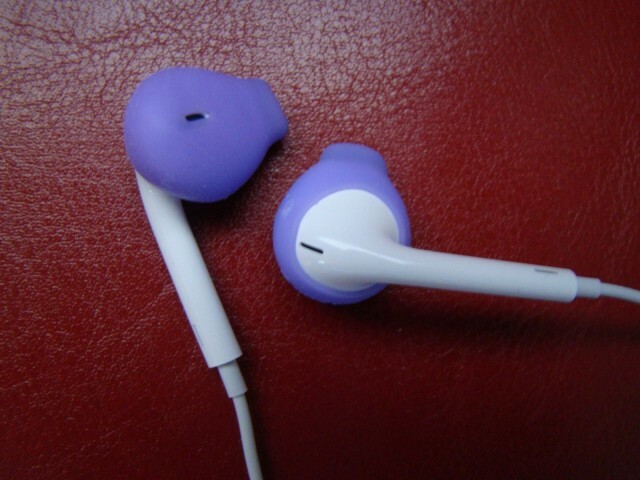 A little bit of twisting and adjusting, and the EarSkinz fit perfectly, with holes for both open areas on the EarPods. The only niggle here is that the EarSkinz cover up the L and R indicators on the EarPods, making it tricky to know which one goes in which ear. Placing the EarSkinz-covered EarPods into my ears took a bit more energy than usual, as the material they’re made out of isn’t very slippery. This is a good thing, of course, as they didn’t slip out of my ears, ever, during some very sweaty and energetic runs and workouts. EarSkinz fit extremely well in my ears, only adding a slight bit of thickness to the EarPods themselves, with a ton of extra “staying-in” power. Taking them out of my ears also takes a bit extra effort. Imagine my surprise when EarSkins turned out to be an essential accessory for my set of EarPods. 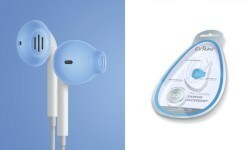 Comfort-wise, the EarSkinz add a little bit of cushion and softness to the hard plastic of the EarPods. Without the EarSkinz, I’ve been known to take the EarPods out of my ear after an hour or two of use, as they get a little painful. With the EarSkinz, I’m able to use them all day, sometimes even forgetting they’re in my ears. The only selling point I don’t notice is any improvement in sound. I tried listening to a couple of different songs in varying genres both with and without the EarSkinz in place; I couldn’t tell the difference. Perhaps I would have with a pair of older-style Apple earbuds, but I didn’t review the ES1 model, which does in fact change the shape of the earbud to match the EarPod style. All in all, I’m keeping these EarSkinz on my EarPods, for both working out and regular, daily use. They’re definitely worth the $10.95 per pair. The Good: Solid comfort and exceptional fit, the ES2 models stay in the ear, adding a bit of comfort along the way. The Bad: Obscures the L and R symbols, EarPod model doesn’t improve sound. The Verdict Definitely worth the money if needed for running, working out, or wearing EarPods for longer periods of time. The variety of colors helps customize EarPods to each user’s own taste.